Inspiration comes from many sources. The beautiful sunrise that started one of the best days of your life; those words of wisdom that someone you look up to took the time to impart to you; that crazy possum that keeps scratching on your roof and waking you up at all hours of the night… Inspiration. To write, to act, to change, to get a torch and shine it madly into the night while screaming at THAT DAMNED POSSUM TO LEAVE YOU THE HECK ALONE!! Sometimes inspiration hits us like a freight train and others (like that possum…) it works its magic in the background, building a slow crescendo until it finally becomes the creation or action it was intended to be. Regardless of its origin, or the time in which it introduces itself to us; inspiration surrounds us each and every day. As an imaginitive child I drew inspiration from many sources (much as all children do I suppose) and one of those inspirations that I recall fondly was a puppet. Not just any puppet though. That’s right – I was once the caretaker of an Animal! He was my favourite toy and one of my three favourite Muppets, I’m sure you could probably guess the other two. I loved the way he was just untamed and wild; so totally different to the kind of kid I was. I can’t remember where he came from or when, but that’s not really important in the scheme of thigns. What is important is how he inspired me, not only to live life more adventurously but also to pit myself against sometimes unconventional challenges. 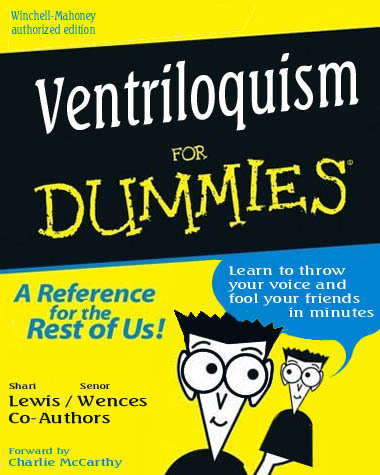 Thanks to him I even learned a little ventriloquism. That's right - for dummies! As far as puppets go he was very simply constructed. His head was the focal point and had been carefully constructed with blinking eyelids and of course a flapping mouth. Obviously the fact that he was made for children was carefully considered and because children would ultimately be engrossed in watching the puppet’s wild eyes blink and be laughing at how his mouth moved so crazily they wouldn’t notice much else. So this enormous, fully functional head sat atop a wafer-thin body made of nothing but cheap orange fabric with his cheap yellow shirt and torn blue jeans adding the finishing touches. The good thing about his flimsy body was that it made him exceptionally easy to store. It was even part of the fun. His hands and feet were fixed with velcro patches that made him a toy for the sporting types as well. All you needed to do was roll his body around his head and velcro his hands and feet together and you had an impromtu football. 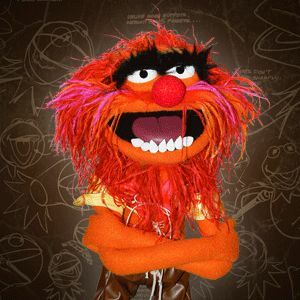 Like me, Animal was always keen to fit in everywhere. I played with him often, he never complained about me constantly shoving my hand into his back and making him say all the things I wanted him to say. He lay silently nearby as I drifted off to sleep at night, keeping stalwart watch over me with his unblinking eyes. Eventually though, Animal found his way to someone else and my dreams of becoming a ventriloquist turned into something else entirely. These days I find inspiration in many other places, people and experiences but still it usually visits me when I least expect it. Is there a particular toy from your childhood that you learned more than you expected from? thank you for posting this! I know I am slacking on reading these on time…but today I needed a positive inspiring push! Thanks for that!!! Ms. Piggy was another favorite–but I learned that being superficial gets you no where. 🙂 CHAO! You’re very welcome, as always thanks for reading at all! Being a goofball is always ok; I say we should take a little more time to be silly every now and then.